As Chicago teachers enter day two of their massive strike, parents and students are struggling with unexpected days off. However, there is hope that the walk-out may end soon, with both the teachers union and the school board saying progress is being made in negotiations. NBC's Kevin Tibbles reports. Updated at 11:10 p.m. ET: Some 350,000 Chicago schools students kept from class on the first day of a teachers’ strike remained in limbo at day's end, with no news of a new contract between the teachers union and the school district. The strike launched Monday by 26,000 teachers and support staff highlighted a bitter standoff between teachers and Mayor Rahm Emmanuel, who is pushing reforms on the city’s schools, the third-biggest public school district in the nation. Teachers dressed in red T-shirts rallied in front of the Chicago school district offices in the center of the city, breaking through barriers and spilling onto the streets, the Chicago Tribune reported. "Hey Rahm, how many kids in your child’s classroom?" read one sign at the district offices, according to the Tribune reported. Some in the crowd chanted: "Hey, hey, ho, ho, Rahm Emmanuel has got to go." Parents in Chicago on Monday scrambled to find accommodations for their kids after 26,000 teachers and support staff walked out in the nation's third-largest school district. NBC's Kevin Tibbles reports. Emmanuel derided the union action, calling it "a strike of choice. And it’s the wrong choice for our children. It’s totally unnecessary, and we need to finish the job." He urged both sides to "stay at the table and finish it for our children," but refused to bend on two key issues at the heart of the standoff: allowing principals the right to choose teachers and teacher evaluations that are based in large part on student test scores, the Chicago Sun Times reported. The walkout came after a weekend of unsuccessful eleventh-hour contract negotiations between the Chicago Teachers Union and Chicago’s public schools. On the first day of the strike, parents in Chicago scrambled to find accommodations for their kids. As the two sides went back to the table on Monday morning, many parents dropped their children off at 144 contingency locations, "Children First" sites that the school district was keeping open for half days during the strike, allowing some parents to work. Chicago Mayor Rahm Emanuel urges teachers to "stay at the table" and negotiate a deal "for our children." Watch the news conference. Dozens of churches and community organizations also opened their doors to students for at least part of the day. Striking teachers take to the streets near the Chicago Public Schools headquarters after walking off their jobs when negotiators failed to reach agreement on a new labor contract in Chicago, Sept. 10. .
John Harvey and Sarah Vanderstow were dropping off their 7-year-old son, Aiden, at the Disney Magnet School, but they were nervous because it was unfamiliar to the second-grader, the Chicago Tribune reported. Vanderstow said they had no choice because their usual school, Nettelhorst, was closed. "I don't know who these people are who will be watching him and that concerns me," she said, according to the Tribune. "But I have to go to work and we can't afford to pay for him to go somewhere else all day." Another parent, Vicente Perez, who spoke to the Tribune decided against dropping his fourth- and sixth-grade sons at a contingency location when he realized they would have to cross a line of picketing teachers, which scared the boys. Perez and his wife decided to take their children to a church, or just keep them home, the report said. After a violent Chicago summer, police Supt. Garry McCarthy said he was "emptying our offices" to patrol the thousands of unsupervised kids on the streets. The union has called the plan to care for children during the strike a "train wreck." It warned that caregivers for the children do not have proper training, and there are fears of an increase in gang-related violence in some high-crime areas. Teachers picket outside the Chicago Public Schools headquarters on Sept. 10, 2012. The union and school district negotiated throughout Monday, but when school board president David Vitale emerged from the talks, he said no agreement had been reached, Reuters reported. "We have said to them (the union) again that we believe we should resolve this tomorrow, that we are close enough to get this resolved," Vitale said. The teachers union did not immediately respond to a request for reaction to Vitale's comments, according to Reuters. 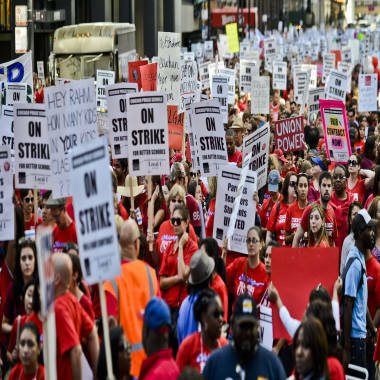 The strike follows more than a year of slow, contentious negotiations over salary, health benefits and job security, NBC Chicago reported. The talks broke down not over pay, but over proposed reforms, Reuters reported, citing sources on both sides. The union opposed a proposal to make student test scores a key factor in teacher evaluations, the report said. They also opposed a move to give principals more control over hiring, which could undermine the seniority system that protects long-time teachers. "We have failed to reach an agreement that will prevent a labor strike," Chicago Teachers Union President Karen Lewis said. Chicago teachers make an average of between $69,470 and $76,000 per year, second-highest to New York City. The deal Chicago Public Schools put on the table includes a 16 percent average salary increase, said Vitale. "This is a difficult decision and one we hoped we could have avoided," Lewis said Sunday. "Throughout these negotiations, we've remained hopeful but determined. We must do things differently in this city if we are to provide students the education they so rightfully deserve." Vitale said more than 20 offers had been made to teachers throughout the talks in hopes of preventing a strike. "There's only so many things we can do that are available to us that we actually believe will not hurt the educational agenda that we think is best for our children," he said. He said the deal his side put on the table would cover four years and cost the city $400 million. "Recognizing the board's fiscal woes," Lewis said the two sides were not far apart on compensation, which had previously been a major sticking point. Issues preventing a deal were health benefits, the teacher evaluation system and job security, echoing debates that have played out in school systems across the country in recent years. The strike could hurt relations between Obama's Democrats and national labor unions, which are among the biggest financial supporters of the Democratic Party, and will be needed by the party to help get out the vote in the Nov. 6 election. While Emanuel has not attended the talks, he and Lewis have clashed. She has accused him of being a bully and using profanity in private meetings. GOP presidential candidate Mitt Romney offered his view of the strike, characterizing it as another issue on which he and President Obama differ. "I am disappointed by the decision of the Chicago Teachers Union to turn its back on not only a city negotiating in good faith but also the hundreds of thousands of children relying on the city's public schools to provide them a safe place to receive a strong education," Romney said in a statement on Monday. He charged that Obama favors unions over students. White House press secretary Jay Carney suggested that Obama hadn't chosen a "side" in the fight, and instead hoped for a consensus solution to avert further lost days of school for students. Teachers walked off the job for 19 days in October 1987. Prior to that, there had been nine strikes between 1969 and 1987. Teachers at the city’s charter schools — serving about 45,000 students, or 12 percent of the city's total — were not part of the strike and those schools functioned normally. NBC Chicago and Reuters contributed to this report.